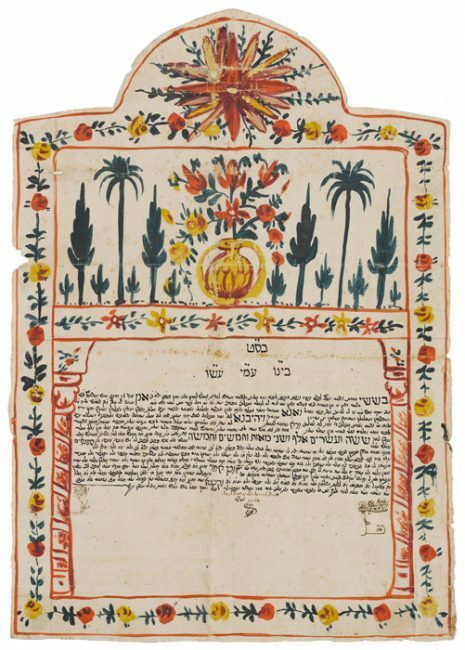 Between the 1830s and 1860s ketubbot from Jerusalem were decorated according to a more or less fixed pattern, with a central floral device in the upper part of the document and images of cypresses and palm trees in the area directly above the actual contract. Cypresses were the main building material of Solomon’s Temple and are a symbol of the heavenly Jerusalem with its rebuilt Temple in the world to come. Total dowry: 26,000 “lion” piastre.